HERO ARTEFACT: HOE – there are more than 20 hoe in collections around the world. 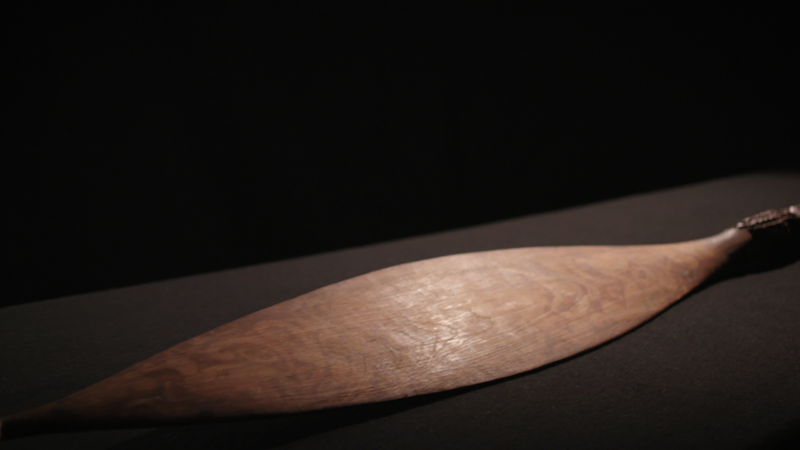 The hoe (or paddle) is a remarkable taonga because it was one of many exchanged by Māori from the East Coast (Tai Rawhiti) with crew from the Endeavour in 1769. The hoe represents the very first cultural encounter and exchange that took place at a time when Māori and European knowledge of each other’s worlds was completely non-existent. The hoe was part of a set used to paddle a waka taua (war canoe). It’s thought the hoe were probably given as a gift to Tupaia, the Tahitian priest-navigator-interpreter who accompanied Cook and his men to New Zealand. Oral history says Māori knew he was on board and they wanted to make a connection with him. Descendants of the Māori who exchanged these hoe with crew on the Endeavour in 1769 are keenly interested in the hoe and value them for their intricate carved and painted designs as well as for their beautiful form.